What is Bishop's Castle Heritage Resource Centre? Bishop's Castle Heritage Resource Centre is a local heritage store and activity centre celebrating local history and keeping it within the community for people to use and enjoy. Bishop’s Castle Heritage Resource Centre is owned and run by the House on Crutches Museum Collection Trust, which is responsible for the displays in the House on Crutches Museum. Bishop's Castle is a small market town situated in a remote, largely agricultural region of South West Shropshire. Due to its geographical remoteness, local heritage in Bishop's Castle has enjoyed a degree of protection from outside influences. 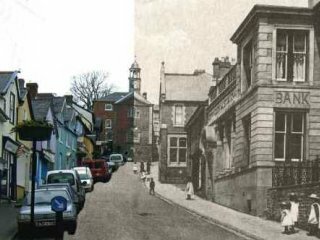 The town has retained much of its historic character, and a strong sense of heritage has given rise to numerous active local history organisations. 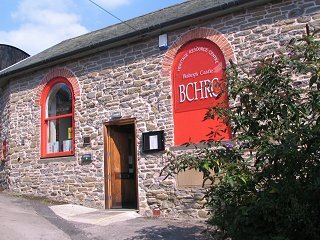 Bishop's Castle Heritage Resource Centre opens as a Local History Centre	on 2nd October 2010 and our volunteers can help you to find the resources to research your family history or social history query. Individuals and organisations can deposit their archives in our secure museum standard store. Our main depositor is the House on Crutches Museum Collection Trust, who store their reserve collection with us, and you can view some of their collection online. We are always happy to work with schools and individuals on education	projects, and can also organise educational visits to Bishop's Castle Heritage Resource Centre, the House on Crutches Museum and the Bishop’s Castle Railway and Transport Museum. BCHRC provides a range of facilities and services from photocopying and laminating to specialised services such as the production of displays and interpretative material and digitisation of documents. Our small meeting room is ideal for meetings and workshops up to a maximum of 15 people, and we have a small range of equipment for hire, such as display boards. Charges for all of these facilities are at a reduced rate for affiliates. Both the museums and Bishop's Castle Heritage Resource Centre are volunteer-run. If you are interested in joining our enthusiastic team, or just want to find out more, do drop in to see us or get in touch. As well as regular meetings of our House History Research Group and our Saturday morning self-help Family History Group, BCHRC engages in a wide variety of projects, some involving archival research. From November 2010 we will be embarking on Chronicles of our Shropshire Hills, a project during which we plan to record as much material as we can find on Bishop’s Castle and its surrounding parishes. To find out more about what is happening at Bishop's Castle Heritage Resource Centre, please visit our What’s On section.